Majestic in appearance and superb in presentation. Surely one of the best looking hotels in Australia. 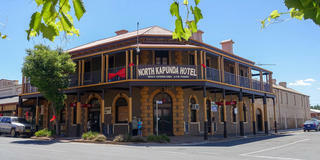 Located in the former and historic copper mining town of Kapunda only 40 kms from Gawler. The North Kapunda Hotel has been fully restored to its former glory and is truly magnificent in appearance. The hotel has been under management for 5 years and is ideally suited to a hands on owner operator couple family or sole trader.